Where in Europe are young people leaving education early? Spain sees the highest number of young people leave education early, according to data from Eurostat. In 2014, over one-fifth of Spaniards aged between 18 and 24 had completed no more than a lower secondary education. To be counted, young people had not to have been in higher education or training in the four weeks prior to being asked. Leaving early does not necessarily imply that young people have failed to achieve the minimum qualifications decided by national governments. Rather, it highlights the number of students who do not go on to gain higher levels of qualification – an achievement that the European Union has made a central part of its growth strategy. The following chart shows the situation across the EU and in some neighbouring countries. Following Spain in second place is Malta, where again more than 1 in 5 young people have no more than a lower secondary education. The top three is completed by Romania. Across the EU, more than one in 10 young people have left education early. As part of its Europe 2020 growth strategy, the EU is aiming to get the “rates of early school leaving below 10%”. The idea is that increasing education levels will increase employability, help tackle unemployment and therefore help reduce poverty. As was highlighted in last year's Human Capital Report by the World Economic Forum, the strength of a nation’s workforce is a vital determinant of long-term economic success. Education is at the centre of ensuring people have the skills they need. 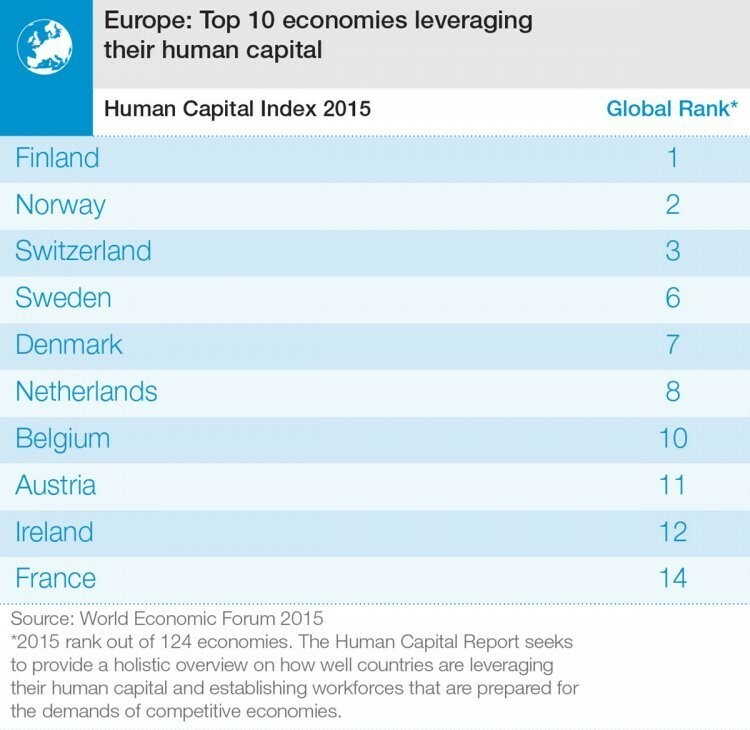 Although many European nations are making good use of their talent pools, there is always room for improvement. Europe 2020 is a key part of this.